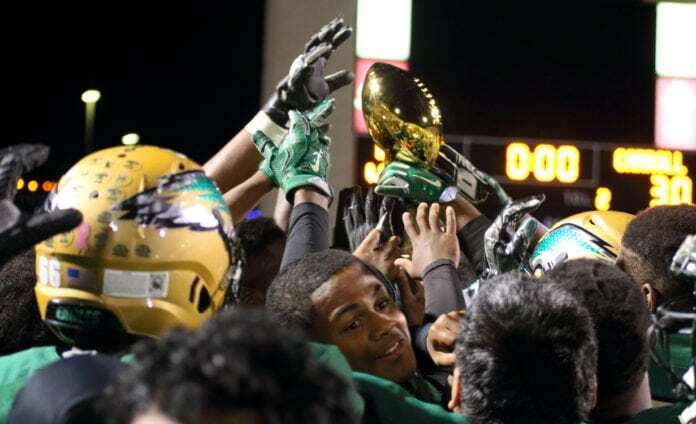 ARLINGTON—DeSoto returns to AT&T Stadium to face Cibolo Steele Saturday, December 17 in the 6A-Division 2 State Championship game. After a comeback victory over the Klein Collins Tigers, the Eagles remain undefeated going into their first championship game. 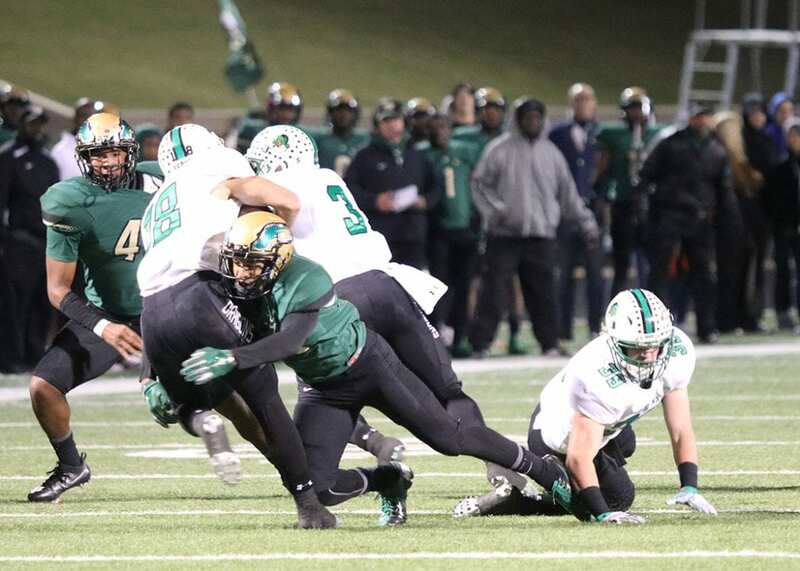 The Eagles last faced Steele (14-1) during a September 2015 non-district game when they fell 35-32. Steele’s highly powered offense and defense was able to gain and hold an early lead over DeSoto. Starting the second half down by 15 points at 28-13, DeSoto rallied to overcome the San Antonio powerhouse in the remaining minutes. Then Quarterback Tristan Wallace led his squad to the red zone on three separate occasions, connecting on one occasion with now Senior WR Laviska Shenault. The Eagles offense was stunted in the remaining four minutes by Steele’s defense and their own penalties. A number of things have changed since the Eagles last met the Knights. The offense has an active and mature quarterback. 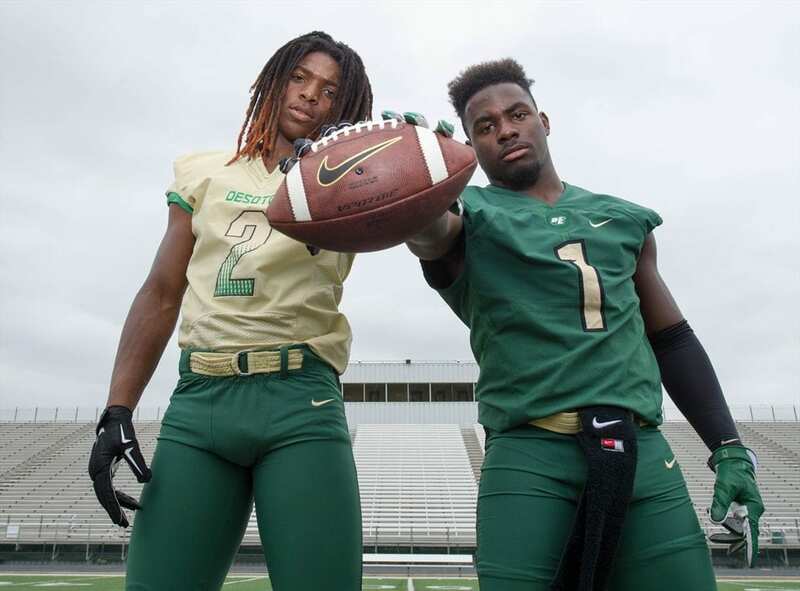 The receiving corps has been expanded, and the DeSoto defense is on fire. As a matter of fact, the last two post season matches have been decided by the defense. Shawn Robinson scores from 20 yards out to make the game score 23 to 10 in the Eagles favor against the Cedar Hill Longhorns on September 23, 2016. You cannot begin any top player list without Shawn Robinson at the top. The 6’1″/217-pound quarterback has a strong arm and is not afraid to execute the option. In 15 appearances he has logged 4,463 yards (3,191 passing/1,272 rushing). He’s accurate too. The TCU commit has only 8 interceptions and 3 fumbles the entire season. 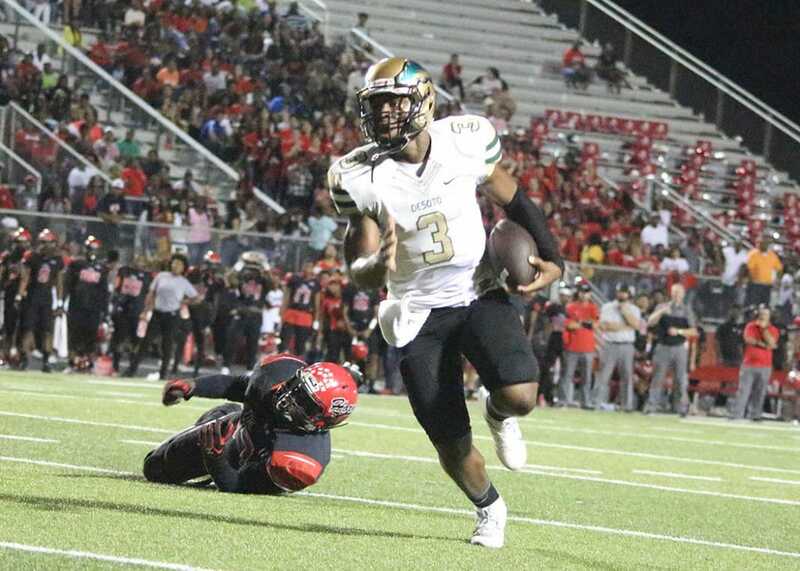 Only a Junior and DeSoto Eagles Running Back Kelan Walker is boasting the highest rushing yards among the receiving corps. Walker averages 7.2 yards per carry, totaling 809 yards. Washington is just short of Walker with 743 rushing yards and 11 touchdowns. 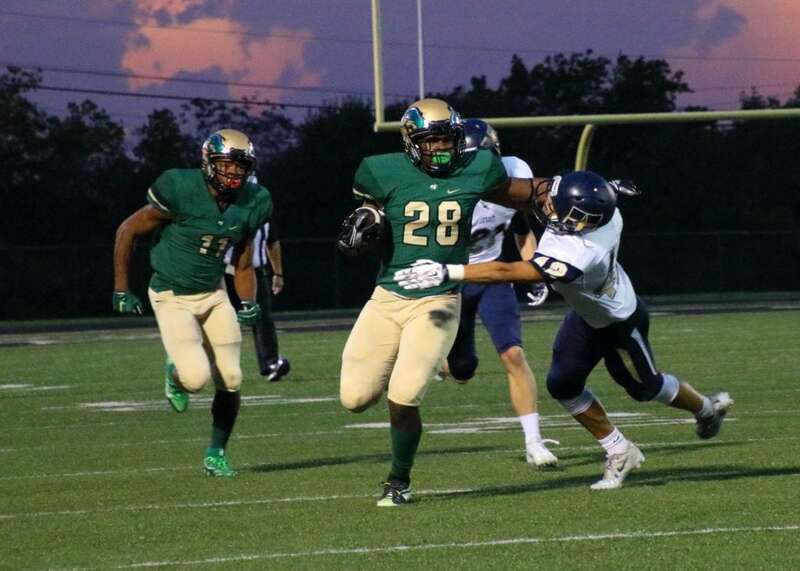 In the comeback win over Klein Collins, he scored twice and ran for 70 yards. You can’t talk about offensive power without Eagles’ wide receiver KD Nixon, Robinson’s right hand man. During the first drive of each game, without fail Robinson attempts to connect with Nixon for an early score. No other wide out’s stats comes close to Nixon. To date he has 1,100 receiving yards. The potent ball carrier has become a target for opposing defenses. Head Coach Todd Peterman has had to put him in the running back slot to avoid double teaming. Shenault is the only Senior member of the offense that scored against Cibolo Steele during the last season. Shenault comes second to Nixon in receiving yards but exceeds his teammate in the 18 average yards per catch. As explosive as the Eagles defense has been as of late, it is difficult to pick only a handful of luminaries. Especially considering how evenly matched they are. Kolby Watts, Caleb Ervin, Orion Smith, Ashton Brooks, Josh Midgette, Brian Robinson, Wesley Green all have double digit tackles. At any point, any defensive player can make a game changing play. Tickets to Saturday’s 6A Division 2 State Championship game at AT&T stadium are still available for purchase for $15 online through ticketmaster.com.